I’m currently saving up money for a downpayment on some land to build a house. I was surfing the internet and this caught my eye. Yeah…I can totally see myself in this! This is November Thing, even though I’m publishing it in December. Sorry for the delay. Christmas with my paternal grandparents has come to be an interesting affair. At first, there were the traditional surprise gifts. Then Grandma would make us compile lists for her at Thanksgiving, and from this list she’d pick out a couple items to give us. This year, she gave each of us a check and told us to get what we wanted, wrap it up and merry Christmas. I don’t know what she expected for me to buy, but I’ll bet it wasn’t what I got. So why do I want to learn archery? In all honesty, the Hunger Games has quite a bit to do with it. In the books and movies both, Katniss is pretty friggin’ cool. I mean, I liked Legolas and other movie archers, but something about Katniss just blows all other archers out of the water in terms of awesomeness. Anyway, she was the first archer that made me think: “You know, I want to try that for myself.” Grandma’s Christmas money gave me the perfect justification to make the leap from thinking about it to actually doing it. I went on Amazon and clicked “Add to cart” on a Bear Titanium Youth bow. I always knew that if I was going to do this, it was going to be with a longbow. I guess it’s the same reason I have a Cruiser bike: I’ve got something against gears. I’m a little bitty girl and I want everyone to know that it’s all me pushing up the hill and pulling back that string. My residents call me “Hannah little but mighty” and call for me when they need brute strength. Yeah, I got this problem with pride…but that’s a story for another day. So the box came, and I pulled out a bow. Even though I was supposed to wait for Christmas, I was so excited that Mom let me have one arrow to try…you know, just to check and make sure the bow wasn’t going to snap like a twig or something. I went down into the yard, carefully selected a direction to shoot in that didn’t contain anything likely to bleed, break, shatter or sue me if hit; strung the bow and fitted the arrow to it. Then I wrapped my first three fingers around the string and pulled back. 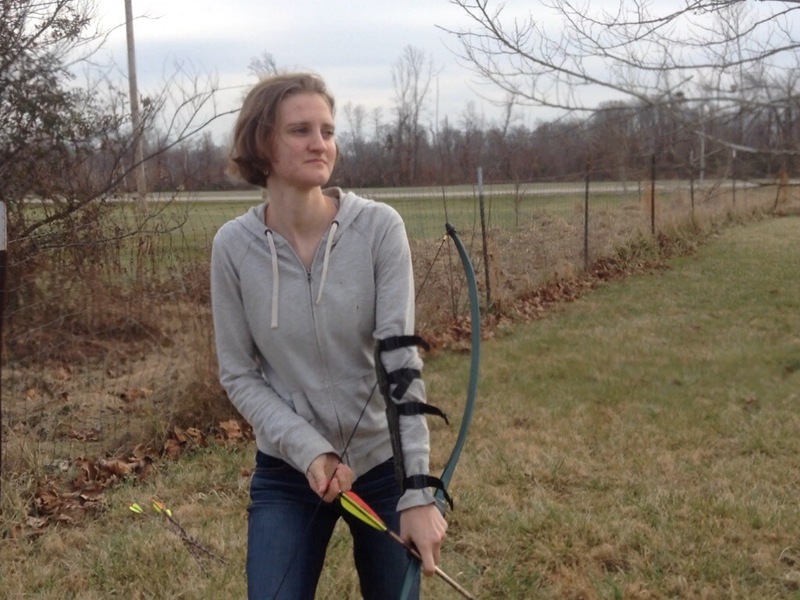 I know it was youth bow, perfect for someone my height and weight…but still, I was pretty dang proud that I could draw the bow all the way back. I wasn’t sure what to expect (probably an epic fail) but the actual experience of shooting that first arrow will stick with me for the rest of my life. It’s a moment I remember with perfect clarity. To remember is to relive. There’s a moment, when you’re first holding the arrow to the bow. You’ve got the notch to the string and the string pulled back to your check; you’re looking down the shaft and breathing. Everything is still. And you realize that up until that moment, you didn’t really believe the arrow could fly. Archery is just a trick of Hollywood, a gimmick of the screen. But that arrow is sticking the ground, halfway across the yard, and it feels like your heartbeat put it there. You can still feel the backwash of all that power echoing in your arm. You’re definitely going to need more arrows. Lots more. I heard once that the best definition of art is tension and release, and I’ve found that in writing, this is God’s own truth. It’s true in archery as well. Tension: inhale and pull back. Release: exhale and let go. In the end, archery is easy. It’s breathing focused and propelled forward.